We have to admit we were a little skeptical about this one at first. 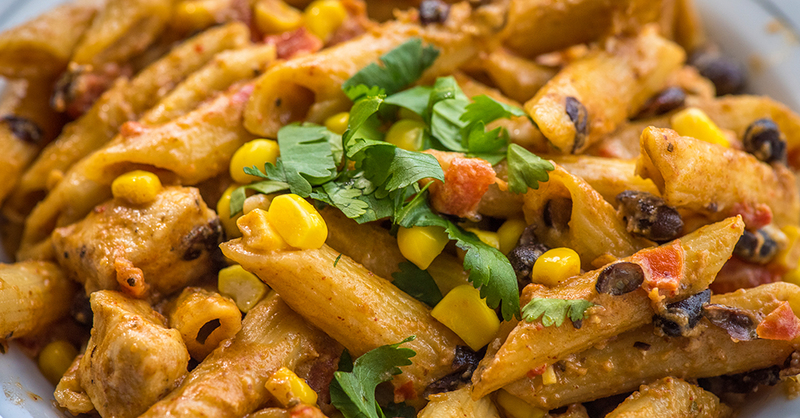 We are huge fans of both Tex-Mex and a delicious creamy alfredo, but combining the two? Hmmm….. Let’s just say we were skeptical. But fear not! We’re nothing if not adventurous and after one bite we realized how wrong we were! This dish is so creamy and flavorful, and the zesty south-of-the-border spices are mellowed out by the velvety, made-from-scratch alfredo sauce. And although we didn’t include it in this recipe, we’re betting you could add some diced chilies or even a chopped jalapeno for an added kick of southwestern authenticity! The best part is everything cooks up in under half an hour, in one skillet. Yep, that’s right, even the pasta noodles! And since it’s so hearty, there’s no need to make a side dish, making it a winning option for an easy weeknight dinner!